Here is a tale of a fantastic Durga statue which disappeared from the Temple in Kashmir in the early 1990’s. It involves the militancy in Kashmir, International Antique smuggling syndicates, Museums, International Diplomacy, the Un, the Governments of India and Germany, the respective Prime Ministers and Chancellors and one man’s quest to bring it back home. A true international thriller if you may. The Tengpora Durga is a 8th Century masterpiece of Kashmiri stone work. It was produced at a time when this art had reached its zenith. It goes without saying that some of the best Stone sculptures in the world were the Kashmiri craftsmen. I have been studying these sculptures from the Himalayas especially from Kashmir, Tibet and Nepal and can say that both Tibet and Nepal were influenced by the Kashmir sculptures. And the Kashmiris were influenced by the Gandhara School. This particular idol of Durga is special as it portrays an Eighteen handed Durga instead of the Ten handed Durga that was the norm usually. The Statue was supposed to be the longest continuously worshipped statue of Durga in the Indian subcontinent and was kept at a Temple in Tengpora in Kashmir located in Pulwama. The Temple was held in high reverence and the Idol was worshipped here since the 8th Century. However everything changed with the turmoil in Kashmir with the rise of Militancy and Conflict. Sometimes in the early 1990’s the famous Tengpora Durag disappeared from the Temple. At the same time many such antiquities from Temples disappeared in Kashmir and began appearing elsewhere. Similarly the Tengpora Durga was also lost. Mr.Rakesh Kaul, a Kashmiri, who was the CEO of an American listed Company first came across the Tengpora Durga in 1999, at the Madison Avenue Gallery of Mr.Subhash Kapoor, a well know Indian Antiques dealer not really known for being the cleanest guy in the trade. Mr.kaul came across a vast array of other Devis and Devtas who’s sourcing was also a matter of mystery. As it happened Dr.Pratapaditya Pal, an authority on ancient Indian Art also visited the showroom of Mr.Subhash Kapoor and on seeing the Durga brought it to Mr.Kapoor’s notice that it was a stolen piece which disappeared from Kashmir. Mr.Kapoor, smooth as he was feigned ignorance and said he would look into the matter and that was that. 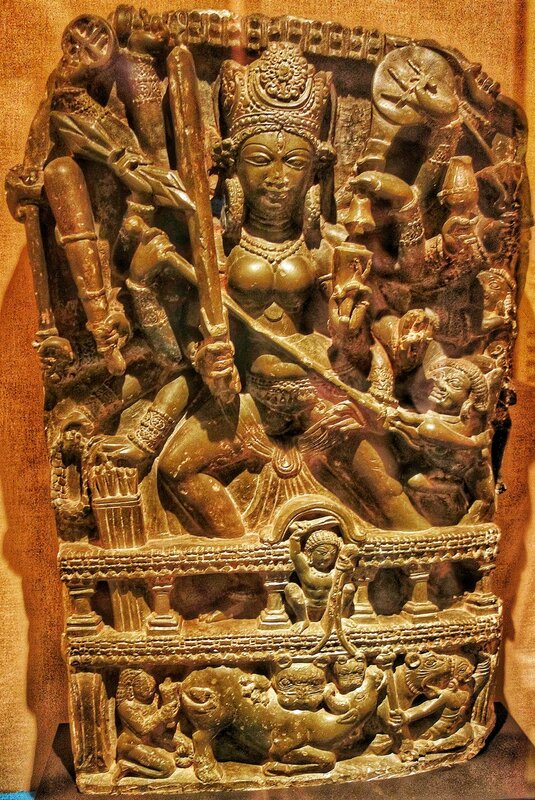 After sometime Dr.Pratapaditya Pal was invited as a speaker at the Linden Museum in Germany and to his utter surprise he found the the Tengpora Durga on display over there. On making enquiries he was told that the Museum had acquired this masterpiece of Kashmiri Art from Subhash Kapoor who sold it to the Museum for a pittance amount of USD 250,000. Subhash Kapoor must have realise that since it was a “Hot’ piece of Art he needed to get rid of it at the earliest and that's what he did and sold it for that amount. Mr.Kaul was in touch was Dr.Pal and discussed ways and means of getting the Durga back to India. But he understood that it wasn't going to be easy as the exact sequence of its disappearance from Kashmir to the tile it appeared in the Linden Museum could not be established. But he kept up his effort and also met folks at ASI who offered him all the help but at the same time said that there is a long list of items that they have been claiming from many countries and this Durga is also down there somewhere on the waiting list. The big breakthrough came when the police in the US arrested Subhash Kapoor for smuggling Antiques. He was already under the scanner as previously a consignment labeled “Marble Furniture” from India had actually turned out to be smuggled Antiques. Subhash Kapoor had feigned ignorance and didn't claim the consignment and was out of the Net. But the Police was onto him. Further the Us Government agreed to extradite Subhash Kapoor to India as he was wanted with theft of various Nataraja Bronzes from Tamil Nadu. Mr.Kaul now approached the Linden Museum directly who were now aware of the antecedents of Mr.Subhash Kapoor and how he turned out to be an International Antique Smuggler. The Linden Museum quietly removed the Tengpora Durga from the display. Mr.Kaul again requested the Museum to return the Durga to India. Another representation went to the Linden Museum who now said that we would now take up the matter with the German Ministry of Culture and Art. Mr.Kaul also wrote to the Indian Ambassador in Germany at that time on the same issue. And the Ambassador also offered to help. By another series of coincidence a British author who had for decades on Kashmir’s Stone antiquities came out with an illustrated book which featured the Durga taken much earlier. Now there was proof in the Public domain attested by a renowned expert on the subject that the piece was from Kashmir and he had last seen it in 1990. But at that time he wasn't allowed to photograph as the locals in the Village were afraid that someone might steal the Durga. Through the same expert the Linden Museum made an informal offer to Mr.Kaul, who was now on a mission of his own to get the Durga back to India. As per the offer they would acknowledge that the piece belongs to the Indian Government but at the same time wanted the Indian Government to give the piece of Art on permanent loan to the Linden Museum. A convenient way to keep the Durga in the Museum and at the same time make the Indian Government happy. However when Mr.Kaul conveyed the same to ASI they flatly refused and Mr.Kaul also told them that they would not settle for anything less than the Durga being returned back. The Linden Museum and the German Government now found themselves in a piquant situation. This was an Antique which was sold to them by an Antiques dealer who was already behind bars with charges filed against him both in the US and in India. Further the piece came from a conflict ridden region which often headlined the News. They knew they were on weak wicket as far as the Durga was concerned. Soon the pressure was being mounted and finally with the new Government in India sworn in in May 2014 a strong impetus was given to such cases. At last the Germans yielded and said that the Chancellor Angela Merkel would bring back and return the Durga to India during her visit in 2015 as a goodwill gesture as it was ethically wrong to keep it in the Museum in Germany. Finally Mr.Rakesh Kaul won and all the effort he had put in bore fruit. I first saw the the Tengpora Durga at the Sri Pratap Museum in Srinagar in 2017 October. I couldn't help but admire this amazing piece of work. I remember standing for a long time admiring the detailing of this sculpture. At that time of course I had no idea of the history and the events that had transacted between the time it disappeared from Kashmir in the early 1990’s and the time it came back to Kashmir to be displayed at the SPS Museum in 2015. It was only while I was Cataloging the collection at the Sri Pratap Museum that I stumbled upon this thriller of story behind the Tengpora Durga. The Durga is best described in Mr.Kaul’s own words “ She was incarnated in her moorthy roopa in the eighth century out of green chlorite stone. She is approximately 68.6 cm in height and 43.2 cm wide. She is in pristine condition. Consistent with the unique style of Kashmir she rides in a chariot with wheels on the side drawn by two lions over the mountain ranges. A diminutive charioteer in charge as is typical in Surya, the Sun God’s chariot. Jingling Bells hanging from the balustrade, supported by six pillars, announce her arrival. She stands in the alidha (warrior) stance telling us to be forever fearless. The two lions grip the buffalo tightly but it is the third lion that crushes within its powerful jaws the mace armed demon of ignorance, which as the egoist essence of the physical buffalo has been released from inside it. The Durga tells us to never be a believer because a believer is bound by ignorance and is a Pashu an animal. Instead one should be a fearless seeker of Truth. This Durga is eighteen armed. Again, Kashmir with the Nilamatapurana text was the earliest in giving a representation of the Durga as having eighteen arms when ten was the rule for all pre 7th century portrayals. In two of her left arms she holds the demons Sumbha and Nisumbha over whom she gained Victory. The right hand holds the lance, a quiver of arrows, a ring wreath, a club, an axe, an upright sword, a vajra and a mace while the left-hand holds a bow, a round shield, a bell, a Kamandalu, a trisula, a horn and an askamala with one hand placed on her left thigh. She wears a tight bodice and a long lower garment with a sash tied across her thighs, the end falling between her legs and a chain girdle of bells around her waist. Annular earrings and bracelets along with a trefoil crown complete her dazzling attire. She is the ruler of eighteen dimensions and she is beautiful. She tells us that a fearless seeker becomes free and freedom is a prerequisite to overcoming Tamas the darkness of inertia. It is only freedom which yields the experience of the beauty of the ultimate truth of reality!